TIME TRAVEL EXISTS! That's the only way to explain AGV's helmet lineup. They make helmets for the sassy scooter rider to the likes of Valentino Rossi and everything in between. 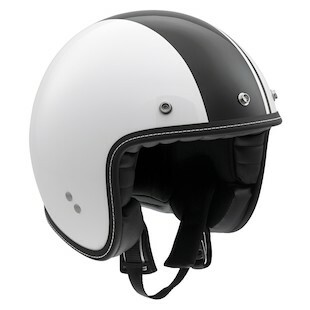 Right in between you have helmets like the 1960s styled AGV RP60 Royal and the futuristic AGV AX-8 EVO Q Code helmet. Someone at AGV has a flux capacitor on their Ducati, access to a TARDIS, or a hot tub time machine in order to offer helmets that are clearly from different time periods in human history. The vintage style AGV RP60 Royal graphic is perfect for the new age cafe racer or classic cruiser. The leather accents may be faux leather, but the helmet is the real deal since it ships with slick goggles and a removable peak. The AGV AX-8 EVO Q Code is straight out of the future with its lightweight carbon, kevlar and fiberglass shell. Guys in the future get hot on motorcycles so the integrated ventilation system helps to keep your futuristic haircut cool. 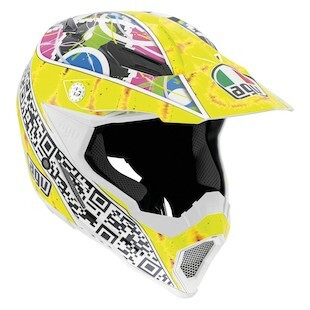 The Q Code graphic will help any motocross rider stand out from the crowd with its psychadelic combination of bright colors and a QR code inspired stripe. AGV has harnessed the power of time travel to fulfill pretty much every motorcycle helmet need. The RP60 Royal's classic design will look at home on your cafe racer project bike or a v-twin cruiser. Dirt riders from 2025 will rock the AX-8 EVO Q Code on their hover-bikes. Just don't try to read the QR code on the AX-8 EVO with your smartphone. Rumor has it that it causes Skynet to become self-aware.